Life With A Mission: Blog Awards! Thanks to Rachelle for giving me these two blog awards! 1. Thank and link back to the person who gave you the award. 3. Give the award to 15 other bloggers. 1. I passionately want to see the unreached people groups of the world reached with the Gospel! 2. My desire is to eventually combine my love of kids (& especially orphans who have no one to care for them), filmmaking, and writing on the mission field (without neglecting evangelism, of course!). 4. And yes, I served on a ship. And when it was sailing I did get seasick for a few hours but the pills seemed to kick in because after that, I was fine. Sailing is fun...when you're not feeling sick. I am so thankful to God that I wasn't sick for the weeks and weeks that the ship was docked in Penang and Port Klang. 5. I don't like calling people I don't know (or don't know well). But if it's one of the few (and I mean, few) people that I'm really close to, I can talk for hours. So I don't completely dislike the phone :). 6. For the past few months, I haven't had much of a chance to read books (unless required for a review). I'm making more of an effort to get back into it. As a child, I used to read all the time and could finish lots of books in one month...maybe even a week. Now it seems to take forever :). 7. I don't tend to be a rule breaker (I don't think so, anyway :)) but I'm going to break rule #3. Anyone who wants to do the "Tell All About Yourself" blog award, feel free. 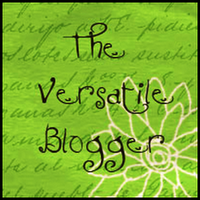 And if you think you're a versatile blogger, grab that one, too! Consider yourself awarded :).